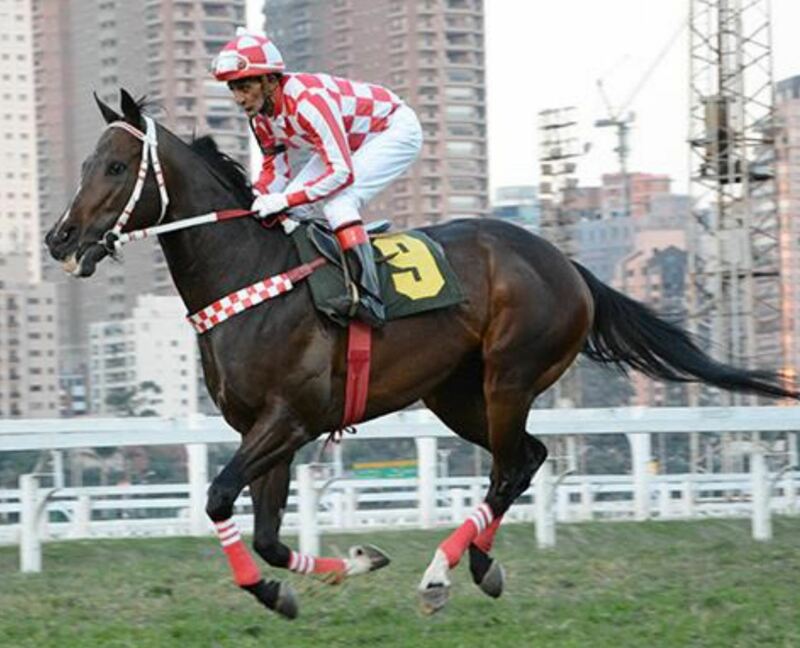 Group 3 winner and multiple G1-placed in Brazil. Broke course record for 1000m in 0:53.518. Dam is full sister to G1 winner Fettucine. Family of G1 winners Pallazzi and Queribus, as well as G1-placed Satin Blue and Viewing Blue. Stakes winner in America. Three-time winner in Ireland and Canada. Half-brother to Champion V.I.P. Zone. Family of Champions Pretty Polly and Donatello II, Derby winners Psidium (English Derby), Daumier (Italian Derby), Half Hennessy (Queensland Derby), G3 winners Ombrage, Maimara, Ahohoney, stakes winners Cisneros, Amato, Frontier-Vision, Honimiere, etc. Stakes winner and Graded-placed in Germany. Half-brother to stakes winners Chameur and Prince Falcon. From the family of Champion Robins des Pins and Group winners King of Happiness and Mystery Rays, etc. Grade 2 second by nostril in San Marcos Stakes and San Luis Rey Stakes. Winner in France, Keeneland and Santa Anita. Sire is Group 1 winner and Leading Sire. From family of Group 1 Classic winner Tap On Wood, Group winners El Mina and El Fabulous, stakes winners Troppo Bello, Americus, Piping Rock, Bounteous, Chelsea Girl, Egalite, Eternity, and Group-placed Guillaume Tell, Cat o'Mountaine, etc. Grade 3 placed in the Razorback Handicap. Three-time winner. Dam is stakes winner and Grade 2-placed at Keeneland. From family of Graded stakes winner Galunpe. Stakes-placed in France. Dam is German Broodmare of the Year. Full-brother to G1 winner Guiliani and half-brother to G1 winner Guignol. Family of Champions Getaway, Guadalajara, Royal Rebel, Alexander Goldrun, Graded winners Guardini, Medecis, Gay Minstrel, stakes winners Guantana, Gouache, Grecia Central, etc. Stakes-placed winner in France. Winner also in U.S. Dam is half to stakes winner in Germany. Family of Triple Crown hero and Leading Sire Seattle Slew, Champions Relento and Hakasaan, English Guineas hero Lomond, G2 winners Desert Secret, Seattle Dancer, Caixa Eletronica, En Guerra, Champion Star, Nasheej, G3 winner Alzora, stakes winners Big Monologue, Krasnaya, Argosy, etc. Winner twice in Germany in 2 lifetime starts. Sire was Champion and has sired Champions. Dam was German Champion 2yo Filly. Half-brother to German Champion 2yo Colt Glad Lion and Group winners Glad Tiger and Glad Panther. Damis full sister to stakes winner and Group-placed Glad Sky. Family of Group winner Glad Master, and stakes winners Glad Hunter, Glady Romana, Ghashia, etc. Winner at 2 and 3 in France. Half-brother to multiple stakes-placed Kapstadt. Family of Group winners Panis (sire), White Cat, stakes winners Endicotta, Political Whit, Hyperactive, Lawbook, Feather Ridge, Little Shocker, Starion, Bright Sunday, Rising Market, Come Back Ronnie, etc. Winner at 2 at Churchill Downs. Family of Triple Crown winner Gallant Fox, blue-hen mare Margarethen (from whom descend Champions Trillion, Tryptich, Treve, Generous, Imagine, Moonlight Cloud, Bullish Luck), Grade 1 winners Rosalind, Life's Hope, A Little Kiss, Amorama, Shamekha, G2 winners Rambo's Jewel, Brave Warrior, G3 winner Partez (3rd in Ky Derby), Graded-placed Heart of Destiny (2nd in G1 Alcibiades), Brother Bobby (2nd in G2 Oaklawn H.), stakes winners Little Happiness, etc. Winner at 2 at Churchill Downs. Half-brother to Rocking the Boat. Dam is Stakes winner at Fair Grounds and G2-placed in the Beaumont at Keeneland. Family of G2 winner Galunpe. Winner at 2 in Ireland. From family of Champions Commander in Chief (English & Irish Derby), Rainbow Quest (Arc de Triomphe), Warning (5-time Champion), Noblesse, So Casual (NZ Derby), Gr.1 winners Yashmak, Full Mast, Scenic, Pistol Packer (French Oaks, Arc runner-up), Gr.2 winners Dushyantor (English Derby runner-up), Await the Dawn, Gr.3 hero Slightly Dangerous, etc. Half-brother to Grade 1 winner Salutos Amigos, and three-quarters brother to G2 winner Sarah's Secret. Dam is multiple Group winner in Argentina.